Good news for about 105,000 Wisconsin seniors. SeniorCare will not end at the end of June. After receiving a letter from the US Health Secretary, US Representative Paul Ryan (R-Janesville) says Wisconsin can keep the prescription drug program for low-income seniors until the end of the year. 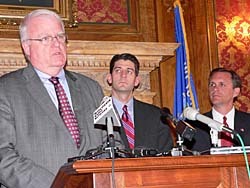 The Janesville Republican says now it&apos;s up to the governor, the legislature, and congress to work together with Health Secretary Michael Leavett to come up with a program to wrap around Medicare. US Representative Jim Sensenbrenner (R-Menomonee Falls) says it&apos;s hard to say whether seniors will have the same level of care and benefits on a new wraparound program as they do now on SeniorCare . "The devil is in the details, and the details are what&apos;s being negotiated now between the Doyle Administration and the federal department of Health and Human Services." Assembly Speaker Mike Huebsch (R-West Salem) believes Republicans and Democrats can put together a good program for seniors. "I believe it is safe to say that the legislature — both houses and both parties — will pass a program that augments, supplements or improves upon Medicare Part D for a number of the citizens." Huebsch says the six-month extension will help make sure no one falls through the cracks. He says they are already notifying seniors and benefits specialists across the state about the extension. In his letter to Congressman Ryan, Secretary Leavett says his office will provide formal approval of the extension once the state has adopted a transition plan.